Defensive back and Linebackers in the NFL will be VERY happy with this announcement…. 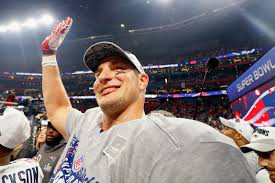 Patriots star tight end Rob Gronkowski ended months of speculation Sunday by announcing his retirement from football after nine seasons and three Super Bowl championships with the Patriots. Gronkowski, 29, announced the decision in an Instagram post after taking nearly two months since the end of last season to deliberate. Gronkowski called Robert Kraft early Sunday and delivered the news a few hours before announcing it to the world. “I am so grateful for the opportunity that Mr. [Robert] Kraft and Coach [Bill] Belichick gave to me when drafting my silliness in 2010,” Gronkowski said in his post. “Thank you for everyone accepting who I am and the dedication I have put into my work to be the best player I could be. But now its time to move forward and move forward with a big smile knowing that the New England Patriots Organization, Pats Nation, and all my fans will be truly a big part of my heart for rest of my life.”….